Yesterday we explored a couple of the restaurants we has scouted our first night in Waikiki. For breakfast we visited Keoni By Keo’s on the corner of Kaiulani and Kuhio Avenue, just steps from our hotel. I ordered the Vegetarian Skillet without egg and cheese. 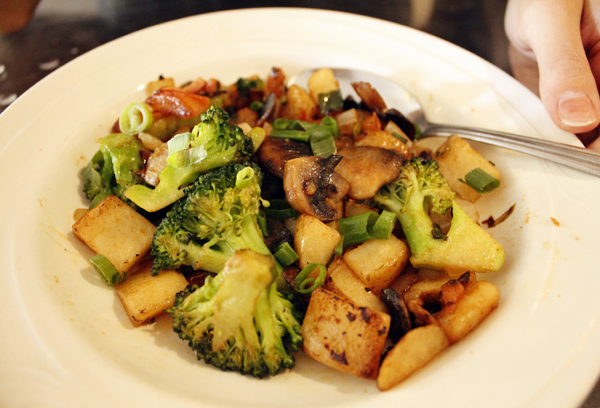 The portion was smaller than I expected, but it was delicious, with a nice variety of hearty vegetables. After breakfast got our swim suits on and walked over to Waikiki beach. The beach was busy with lots of people tanning, napping, and surfing, but we were able to find a nice little spot of our own to relax. Yes, the beach really is this beautiful. The water was cool and crystal clear, but we decided to just sunbathe. For dinner I walked down Kuhio Avenue to Da Falafel King, a wonderful Mediterranean food stand located in front of the Waikiki Trade Center. Mark and I came across it our first night in Waikiki and I knew that before long I’d make it my second home. The owner is from Israel, and has brought the most delicious vegan-friendly food to Waikiki. After I told her I was vegan, she had me taste-test a delicious Pita Chip and showed me all my options. I decided to go for the Falafel Sandwich. I took two sandwiches To-Go after chatting a little while with the two women working at the stand. They were both so friendly and convinced I would be returning soon, which I had already agreed to before trying the falafel. Now, after trying the falafel, I’m sure we’ll be there again. I can assure you this sandwich tastes even better than it looks. The falafel balls were really moist and the vegetables were fresh. It came with a creamy tahini sauce and a spicy green chili sauce on the side. After dinner we spent some time on our terrace watching the sunset over the island. It was so beautiful to see the sun fade behind the building and into the mountains. This is just one of many more sunsets we’ll get to see here on O’ahu, we’re still just trying to soak it all in. This entry was posted in Travel, Travel Restaurant Reviews. Bookmark the permalink. 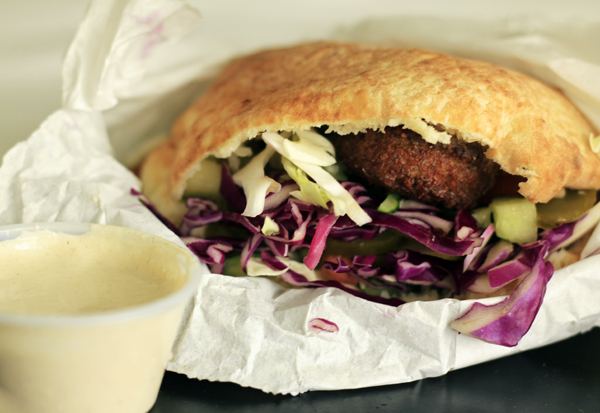 I need to hit Da Falafel King up on my next visit to Oahu; such a great photo you took.